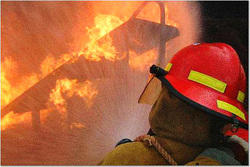 Fire Extinguishers Have Their Limits - Metro Fire LifeSafety Inc. The operator must know how to use the extinguisher. The extinguisher must be within easy reach, in working order, and fully charged. The extinguisher must be large enough to put out the fire. Many portable extinguishers discharge completely in as few as eight to ten seconds. !! ﻿Always be sure the fire department inspects the fire site, even if you think you've extinguished the fire﻿ ! !